Are you suffering from Gadget Fatigue? A new study called "Navigating the Product Mindset" by Underwriters Laboratories has discovered a new "illness" among consumers, called "Gadget Fatigue". Never heard of it? Well, you'll probably be surprised to learn that almost 50% of gadget users are suffering from it, according to the study. So, what's this Gadget Fatigue all about and is it fatal, you may wonder. We'll save you the suspense - thankfully, no one suffering from it is going to die, however, these users might become a bit indifferent towards all of the excitement and developments surrounding today's uber-dynamic market. Basically, if you have Gadget Fatigue, it means that you're fed up with ending up with an outdated device just a few months after you've laid your hard-earned cash for it. Sounds familiar? With the pace of which manufacturers are flooding the market nowadays, many consumers are becoming tired of having to constantly keep up with the latest novelties. Because of that, they have stopped carrying about what's hot right now, and have decided to stick with their otherwise perfectly good handsets for a while longer. In order to back their claims, however, the guys from Underwriters Laboratories are giving the failures of the TouchPad and PlayBook as examples of the presence of Gadget Fatigue in customers. If you ask us, these cases in particular have more to do with poor product execution, rather than people being tired of keeping up with technology, but anyway, we do share the view that devices become seemingly dated too quickly. Another interesting find in this study, although not really one to be shocked by, is the fact that almost 90% of manufacturers consider themselves to be "at or ahead of the curve" in terms of innovation. Do you share their opinion? 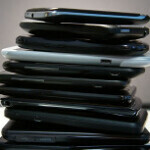 Do you feel the symptoms of Gadget Fatigue? Let us know in the comments below! This might be true for some peeps but, obviously I don't have the damn illness. Its websites like these that give you it. Lol hey i just got a brand new phone on launch day! Its going to be the best ever! Oh according to PA in 2 months its successor will be out!? Wtf!?! Man i have gadget fatigue. Whew... I thought Gadget Fatigue was gonna be when you refresh gadget websites multiple times an hour every single day just to see what's next. Man... good thing I don't have Gadget Fatigue. LOL My GS2 will only be about 4-5 months old before its successor will be announced but I will not feel "left behind". The only reason I will do whatever I can(trade my GS2 for a family memeber's upgrade) to get the GS3 early is because $200-300 is not really that much money for a product that you get this much use out of. And cuz I can afford it. Yes it exists. Thanks to advances in many things from manufacturing to technology, it has happened at an alarming rate. Not such a bad thing if you think about all the advancements but couple that with a focus on getting a product out rather than quality and you will have device after device that may live up to some but certainly the majority might just end up falling dead. Thus, its probably going to only get worse with nanotech hitting mainstream but at the very least we can approach better timelines that focus on something else. Yeah, you pretty much have to get slammed into oblivion by life circumstances to become willing to give up the gadget addiction, and take up the old feature phone again... I know, cuz I'm there right now. Ok who here has actually stayed true to their 2-year contract without buying another phone in that time and without cancelling it? Hahaha!!! This IS my problem... Gadget Fatigue! That, and I have a raging case of cabin fever too. Not me. the only thing that got me fatigue is all these DAMN LAW SUITS I keep reading on here. It should be called "gadget jealousy". People cannot stand it if someone can get a gadget that has higher specs and more features even if the gadget they have works perfectly for them.